If you’re not making obscene amounts of money in real estate right now, you’re missing the best opportunity of your lifetime to get rich. This recession has opened doors for both beginning and seasoned investors, the likes of which I haven’t seen in my 30 years, and I hate to think most people will sleep right through it… and it does not require money, credit, experience or a license to get started. My name is Ron LeGrand and I’ve set aside a full day on Saturday, January 11th from 8:30 am to 5:00 pm to share these secrets with you. You’re invited to attend if you truly want to make this year your best year ever and let this recession make you rich. I call this all-day seminar The Fast Track To Wealth and the title says it all. Click here to Register Now! I am the world’s leading expert in quick turning residential real estate and Dustin invited me to spend the day sharing how I make millionaires. Where the fastest and easiest money is in real estate and how you can get it with NO money, credit or risk on your part. You’ll see how some of my clients and I make consistent paydays of $25,000 or more on each deal and how fast you can quickly duplicate it. The 5 steps to success in real estate, or any business, and why one missed step will crush your empire. Why the easiest money is made on houses in excellent condition in beautiful neighborhoods, contrary to conventional wisdom. You’ll see why it’s not about how hard you work but what you work on. The country is full of hardworking, good people who are broke. Good intentions – lousy results. The two fastest ways to pick up a big check ($10,000 or more) within 30 days after the workshop. This has become common with my students. You’ll see real examples. How you can work yourself out of your job and into a real life within a few months. This isn’t a joke!I’ve done it for a few thousand folks already, and don’t see why you’re any different. If you want your life back, come spend a day at this event. How thousands of my students are getting FREE houses in gorgeous neighborhoods with one key phrase I’ve taught them, and how you can too. In fact, this will probably be your chosen method of buying houses when you are exposed to these secrets. No, I don’t mean the houses are free and clear. They all come with a mortgage, but they don’t require you to assume or qualify for anything, and most won’t cost you a dime. Yes, it is true, legal, ethical, very real and actually very common. This technique alone can and will make you wealthy if you use it. Incidentally, all techniques are taught using real case studies from real students on real houses, many in YOUR area. You’ll see undisputable evidence that everything I’ve said is true. How to buy a million dollars’ worth of real estate without coming out of pocket with one red cent or ever applying for a loan of any kind. How to build a passive income that comes in every month even if you don’t feel like working, or, in fact, even if you are dead. And I’m not talking about rental properties or being a landlord. How you can own a beautiful home for your family within 45 days and never fill out an application, apply for a loan or put up a down payment. Your credit is irrelevant because you won’t be using it. It’s New! It’s Hot! It’s Very Profitable! Session II. How To Make $5,000 Per House On Over-Leveraged Houses And Never Own Them And… Do 4 A Month Part Time! Now we have a simple program called ACTS that’s almost instantly doubling the revenue of my students and my own house business. It’s an amazing, instant exit for sellers who are over financed and upside down as well as free and clear houses and those with a mortgage with equity, and it’s a huge public service for all those millions of buyers who can’t qualify for a loan. You can do three or four a month and make a minimum of $5,000 on each, and my friend, that’s not an exaggeration… if anything, an understatement. (We’re doing 2 a week here in Jacksonville). Last week we collected a $32,000 and a $30,000 paycheck on two houses we’ll never own…both within 30 days. This Is All New, And You Better Learn It Before Your Competition Does! You’ll see how to use real estate to grow your IRA to a MILLION DOLLARS in less than five years without you ever personally contributing another dime. My friend, this very special session alone is worth many times your investment in time to get here. Every word I just said is absolutely true. Did you know your IRA can buy houses just like you can? Once you learn to do it without money, you simply make your IRA the buyer instead of you so all profits go into your IRA…TAX FREE. Your CPA and attorney can’t teach you this because they don’t know about it. Why? Because they don’t understand real estate investing Ron’s way. Trust me when I tell you it will be a long night after hearing about this. You won’t sleep a wink when you hear how you can put your children and grandchildren through college – absolutely FREE. This simple secret is making TAX-FREE millionaires out of my students all over America. Won’t you join us? Real estate combined with your IRA is the key that unlocks the vault. You see, it has nothing to do with your annual contribution or how much money is in your IRA. That’s not the issue. YOU can open a self-directed IRA with the right company and $500, and grow it into a million if you never make another contribution. I know that’s new to you, and you may have a lot of questions. That’s why part of this live seminar is dedicated to it. When you’re done, you’ll know more than your CPA about growing wealthy through your IRA. I promise you it’s all true. You’ll get the best tool I’ve ever used to absolutely ensure you never hurt for deals, regardless of where you live, and it costs pennies to implement. You could be in the middle of a hundred competitors and use this technique to find deals they’d never find, even if they were using the same technique. These are tough times that require out-of-the-box thinking, and sometimes that’s not easy when your cash flow is suffering. This session will cover what to do if you’re over leveraged in real estate, creditors are knocking down your door and the joy of being alive has vanished…why life doesn’t end when you lose your credit and what to do if it’s getting you down and how to get it back quickly. You’ll take part in a frank discussion of your options and how to not only survive these times but come out on the other side of them stronger and able to handle anything thrown at you. Check From Leads You Bring To Class. Click here to Download a FREE “Lead/Property Information Sheet” to collect information from FSBOs (For Sale By Owner) and bring to class. Call some sellers and complete the form as best you can. During the class, I’ll show you exactly how to fill out the form, where to find the FSBOs and prepare you with the right prospects to turn into checks within 30 days. We’ll have a live session where I go through some of your leads and I’ll examine all of them during lunch while you’re eating and pick out the deals from the duds. When’s The Last Time You Attended A Seminar And Got Paid $5,000 For Going? This exercise is priceless to you and will clearly demonstrate how easy it is to prescreen these leads and turn them into cash, so be sure to bring your leads! After the Seminar… And We’ll Provide The VA! My whole focus will be on running a very profitable house business with you doing as little work as possible and letting technology and VAs do the rest. That’s the only way you’ll ever join my growing list of 7 figure earners. Automate! Automate! 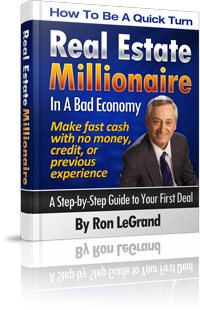 My new book “How To Be A Quick Turn Real Estate Millionaire In A Bad Economy”. I’ll Autograph it for you there. “How To Take Title And Protect Your Privacy” CD – We get a lot of questions about land trusts, what to do, what not to do, where do they work, why use them, etc. They’re all answered in this CD in great detail. That’s right, I’ll give away over $5,000 in goodies in a random drawing. Thanks to Tampa REIA, your cost is ridiculously low. If you join Tampa REIA as a new member or renew your existing Tampa REIA membership for another year, you and a qualified guest can attend for FREE. It doesn’t get any better than that! Just Do It & Register Now!!! It’s a new day and a new time. Real estate investing is a different game now and requires new techniques to stay in it. One such new technique combined with an old technique has changed our industry as we know it…and opened new doors for people to enter the business and start profiting quickly…And Never Buy A House. You’re in and out in a few days with no closing costs to you. You don’t need the banks’ permission, can’t trigger the “due on sale” clause, and even attorneys will accept the technique…and it works best on beautiful houses in lovely neighborhoods from the median price on up to million dollar homes. All with no risk to you. Now a new twist to an old technique has turned them into a whole new, sought-after business model. Find sellers who need to get out, some leveraged, some not, and create some easy terms to pass on to a non-qualified credit buyer. Usually it’s a lease option to buy with rights to assign, but sometimes it can be owner financing. Instead of buying or leasing yourself, you simply assign the contract with seller’s consent and full approval of a new buyer and let them lease the house for years until they qualify for a loan. It even works well with sellers over-leveraged, but don’t assume it’s only for over-leveraged houses. Actually about 40% of the ACTS deals we do are free and clear. Yes, I know this will take some getting used to; and your questions are mounting, but they’re answered at this seminar. There are some tricks and traps, and it won’t work on all prospects, but believe me, it will change your business. It certainly changed ours. About 80% of all the deals we do are ACTS. P.P.S. I’ll also update you on the new Dodd-Frank law taking effect on January 10, 2014. This is a deadly law if you make the mistake of thinking it doesn’t apply to you. Online Lead Finder Version 2.8 Has Just Been Released! PLEASE NOTE: If you are an Tampa REIA Member you can download the software for free by logging in to the Tampa REIA Members Only Website and navigating to the Members Only Downloads & Bonuses. If you are a Gold Member, follow the instructions in the ReadMe.pdf file on how to activate the Unlimited Gold Edition at NO CHARGE (a $500 value!). We all know that you can’t do business without leads that you can turn into suspects, prospects, and paying customers. You need lots of leads to work in order to generate your sales, whether it’s real estate, Internet marketing, affiliate marketing, eBay, any other business. 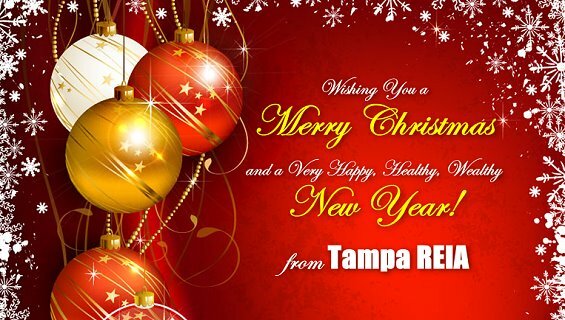 All of us at Tampa REIA want to thank you so much for being a part of our organization this year and want to wish you and yours a very Merry Christmas and a Very Happy, Healthy and Wealthy New Year! We look forward to doing much more in 2014… More deals, more networking opportunities, more affordable training and workshops and more fun! We’ll see you on next year! 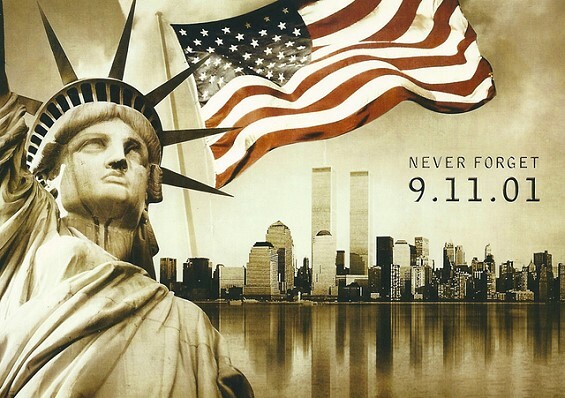 Thanks again and God Bless! Download the December 2013 Edition of The Profit Newsletter Now! The December 2013 edition of The Profit Newsletter is now available for download. You can download The Profit Newsletter as a High Quality PDF (Recommended) or Low Res PDF for slower devices. The Profit Newsletter is the official newsletter of the Tampa Real Estate Investors Alliance and is a digital, interactive newsletter for new and seasoned real estate investors delivered as an Adobe PDF file to read on your PC, Mac, Smart Phone, iPad or other mobile ready devices with a PDF reader. Many of the articles and ads in The Profit contain hyperlinks you can click or tap to visit websites, watch videos, listen to audios, download content, send emails, comment on articles, share socially and much more! The high res version of The Profit is “print ready” for those who want to print the newsletter on their home or business printer. Also, be sure to Subscribe to The Profit so you don’t miss a single monthly issue. On Thursday, December 12th at the Tampa REIA Meeting, Bill Ham will teach you how to create a $10,300 per month positive cash flow and become a multi-millionaire in five years or less by investing in single family houses and then transitioning into apartment buildings! Come join Bill and the rest of us at the Tampa REIA Meeting on Thursday, December 12th at 6:30PM at the Doubletree Suites Tampa Bay located at 3050 North Rocky Point Dr West in Tampa, FL and learn how to invest in apartment buildings without using your own cash or credit. Attend for FREE & Get 2 Awesome Bonuses! Yes, You Can Bring a Friend or Share This Link With Them! As I’m sure you’re aware, every economic recovery provides an opportunity to create a lot of wealth in a short period of time. Dave knows this firsthand because it happened to him about 18 years ago during the last major recession. And, while the years have gone by and Dave continued to buy and sell real estate… 7,400+ total units to date… and he has never done as many deals as he did back then or as he is doing now. Here’s the really exciting news… Dave wants to share with you how he and several other investors did it back then and more importantly… what is working right now, right here in the Tampa Bay area… and HOW YOU CAN DO THESE DEALS & CREATE A LOT OF WEALTH TOO! You’re not only going to get the foundational information and the latest techniques that are working today when you register and attend the event, but you are also going to get Dave’s newly released, PROVEN SUCCESSFUL investing formula that he is making a killing using… and how you can too! Dave’s newly released formula shows you exactly… How to profit big in today’s recovering real estate market. And much, much more! Click here to learn more about the event! 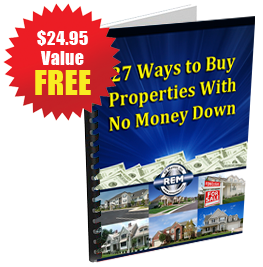 Also, if you Register Now you can immediately download Dave’s new report on “27 Ways to Buy Properties with No Money Down” and get his Wealth Kit for FREE (Valued at $704) when you attend the event. Register Now to take advantage of these free bonuses while they are available. With more than 18 years of experience in Real Estate Investing, David Lindahl has rehabbed over 820 houses, and currently controls over 7,400 apartment units. Starting out as a struggling landscaper with no experience in construction, Dave accepted an opportunity to renovate a foreclosed house for a local bank during the wintertime when there was no landscaping to do in Boston. The job was completed mostly with the advice of relatives and friends who knew how to do the work. After completing the first house, he did another and then (after getting over his initial fears) began to buy and hold small apartment buildings for himself. To get the money for down payments (he originally used credit cards until they ran out! ), Dave would rehab single-family houses to “flip” for chunks of money, so he could buy more apartment buildings. Guests & Non-Members can attend this month for FREE! On November 14th at the Tampa REIA Main Meeting, Reggie Brooks will teach you how to to find these abandoned and distressed properties, find the owners, and structure a transaction that is mutually beneficial to both you and the seller. You will learn how to automate the process of finding the properties, the owners and create a profitable business where you get the abandoned properties chasing you, rather than the other way around. Reggie’s “Abandoned Property” presentation includes case studies of people who have used his Abandoned Property System to create huge profits buying and selling these unwanted homes. Come early to network! Come ready to learn! Come with pad and pen! Come ready to participate! Come join us at Tampa REIA on Thursday, November 14th at 6:00 PM at the Doubletree Suites Tampa Bay located at 3050 North Rocky Point Dr West in Tampa, FL to learn how to profit from abandoned properties. We look forward to seeing you there! Download the October 2013 Edition of The Profit Newsletter Now! The October 2013 edition of The Profit Newsletter is available for download just in time for our Tampa REIA Meeting on October 12th. You can download The Profit Newsletter as a High Quality PDF (Recommended) or Low Res PDF for slower devices. The Profit Newsletter is the official newsletter of the Tampa Real Estate Investors Alliance and is a digital, interactive newsletter for new and seasoned real estate investors delivered as an Adobe PDF file to read on your PC, Mac, Smart Phone, iPad or other mobile ready devices with a PDF reader. Many of the articles and ads in The Profit contain hyperlinks you can click or tap to visit websites, watch videos, listen to audios, download content, send emails, comment on articles, share socially and much more! The high res version of The Profit is “print ready” for those who want to print the newsletter on their home or business printer. Also, be sure to Subscribe to The Profit so you don’t miss a single monthly issue. Reggie Brooks has achieved what many people consider to be impossible. He went from making $36,000 per year at the local telephone company, to making over $40,000 per month in his real estate business. Starting out with very little money, Reggie began his investment career in 1986. 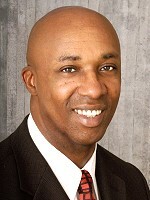 After taking several real estate investment courses he began investing in rental properties in Los Angeles. By educating himself about hidden opportunities in real estate and making well placed investments, he has become a multi-millionaire. Tampa REIA is very excited to announce that our special guest speaker on Thursday, October 10th will be local real estate legend, Jack Shea, who will teach you several Powerful Real Estate Investment Strategies using Land Trusts, Personal Property Trusts and IRA Trusts. At the meeting, Jack will discuss the uses and benefits of trusts in great detail. Jack will reveal the myths and mysteries of trust to show that a trust is simply a contract between the trustee and the beneficiary. Come early to network! Come ready to learn! Come with pad and pen! Come ready to participate! Come join us at Tampa REIA on Thursday, October 10th at 6:00 PM at the Doubletree Suites Tampa Bay located at 3050 North Rocky Point Dr West in Tampa, FL. We look forward to seeing you there! 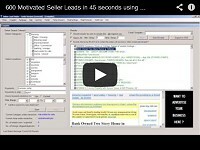 Duncan has updated his famous Online Lead Finder Software repeatedly over the past few weeks. Now, as of today, October 1st, Duncan has done it once again with version 2.6.4! 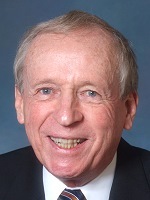 Jack Shea moved to Florida in 1978, and began investing in real estate. 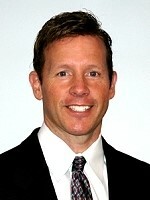 He is a licensed Realtor and Mortgage Broker. 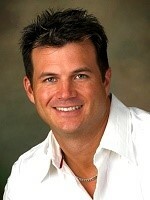 He has done syndications and mobile home development. He also has bought and sold mortgages and notes on real and personal property. Jack Shea has concentrated on buying and selling options on real estate, and has been an investor in single-family and mobile homes. Jack operates a 1031 exchange facilitator business with his wife, Merle, and his son Daniel. He has taught classes to investors nationwide on lease-purchase contracts, note buying, Land Trusts, exchanges and IRA investing. 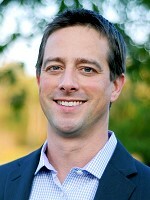 Jack has developed several unique strategies in options, trusts, exchanges and IRA investing. 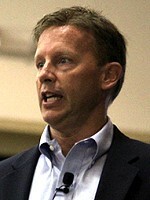 He, along with Jack Miller and a few other investors pioneered the technique of gaining personal control of IRA funds. This required working with several IRA custodians to develop the trust documents necessary to accomplish this. These documents needed to meet the requirements of the custodians and be compliant with the IRS regulations. As a result, every IRA owner is now able to move their funds from the custodian to their corner bank and have checkbook control of the funds. Download the September 2013 Edition of The Profit Newsletter Now! The September 2013 edition of The Profit Newsletter is available for download just in time for our Tampa REIA Meeting on September 12th. You can download The Profit Newsletter as a High Quality PDF (Recommended) or Low Res PDF for slower devices. The Profit Newsletter is the official newsletter of the Tampa Real Estate Investors Alliance and is a digital, interactive newsletter for new and seasoned real estate investors delivered as an Adobe PDF file to read on your PC, Mac, Smart Phone, iPad or other mobile ready devices with a PDF reader. Many of the articles and ads in The Profit contain hyperlinks you can click or tap to visit websites, watch videos, listen to audios, download content, send emails, comment on articles, share socially and much more! The high res version of The Profit is “print ready” for those who want to print the newsletter on their home or business printer. Also, be sure to Subscribe to The Profit so you don’t miss a single monthly issue. You meet with a seller. The seller is VERY motivated and DESPERATE to sell. You’ve been looking for a deal just like this one! Three Questions: How are you gonna fund it? How are you gonna structure it? And once you have it, what are you gonna do with it? Do you know how to use creative deal structuring and financing to make the IMPOSSIBLE deals POSSIBLE? This meeting is like no other! There’s no hype and no bla-bla-bla! Come participate as two experienced investors, Peter Fortunato and Bill Cook, with nearly 70 years of combined real estate investing experience use real-world examples to show how you can make the impossible deals possible. WARNING: This is NOT a sit-on-your-fanny-and-watch-the-show meeting. We want YOU to be part of the meeting and help us find the best ways a deal can be put together! Next, there will be a group discussion about how to best structure and fund the deal. Then Pete and Bill will reveal what they’d do and why they’d do it that way. Wouldn’t you agree that this meeting is an INCREDIBLE opportunity to climb into the minds of two experienced real estate investors and see how their brains work as they construct win-win deals? How they not only make the impossible deals possible – but make them PROFITABLE?!!! And it keeps getting better: Pete and Bill will also discuss how they fund their deals WITHOUT going to banks. Woe unto anyone who dares say that they can’t do a deal because they can’t get a bank loan. This is your only warning: If you say, “I can’t do the deal because I don’t have the money,” you’ll be on the receiving end of Bill’s deadly accurate marshmallow gun!!! BONUS #1: Pete will show you his Benefit’s House. Most investors think a deal consists of just one thing: the house. Actually, a deal has eight parts: Growth, Income, Amortization, Profits, Management, Tax Benefits and Use. You want to be there when Pete talks about how he uses the different parts to make a deal work! BONUS #2: Bill has knocked on homeowners’ doors for a living for more than 35 years. He’ll show you exactly what he does at a seller’s door to get 8 out of 10 sellers to invite him in to see their home. Come early! Come ready to learn! Come with pad and pen! Come ready to participate! Come join us at Tampa REIA on Thursday, September 12th at 6:00 PM at the Doubletree Suites Tampa Bay located at 3050 North Rocky Point Dr West in Tampa, FL! This real estate investors meeting will be like no other meeting you’ve ever attended. Your mind will NEVER be able to SHRINK back to its before-the-meeting size! After this meeting, you’re gonna need a new and bigger hat! And after this meeting, you’re gonna KNOW WHAT’S POSSIBLE!! !